Our fearless reviewer—who just happens to be SLJ's Librarian of the Year and a maker queen—canvassed the entire Javits Convention Center in Manhattan to find the most exciting innovations coming out this year. 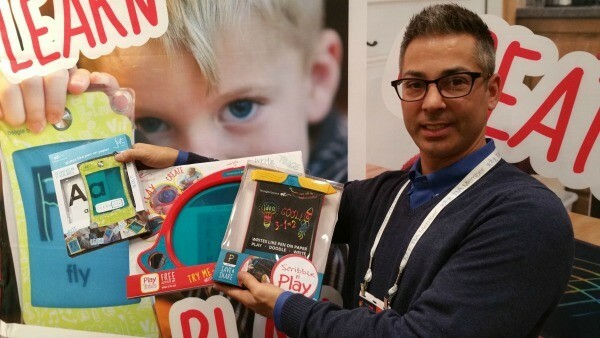 This year, I was fortunate to attend the North American International Toy Fair 2016 at the Jacob K. Javits Convention Center in New York City. Thousand of exhibitors of toys, games, and youth entertainment products covered the 415,000 net square feet of exhibit space. 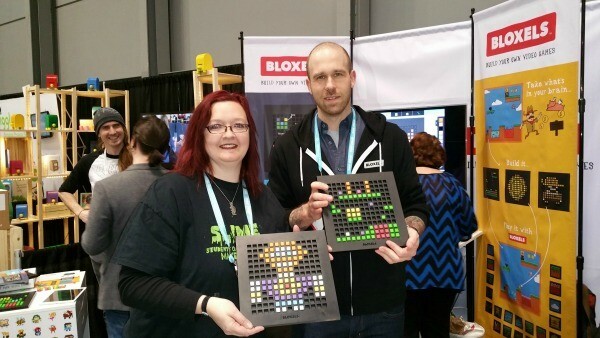 The author, left, showing off her Bloxels creation. When I first learned about the video game design app Floors by Pixel Press, I was (yes, I’ll say it!) FLOORED at the idea that anyone could create a video game without coding skills. By scanning shapes, or glyphs, drawn on graph paper, the free app could transform recognizable markings into a playable video game. With the new Bloxels kits, Pixel Press has completely transformed video game design to a tactile experience. By arranging half inch–square colored blocks on a black tray, users can create levels characters, animations, and even objects. Children will be drawn to the familiar look of Minecraft; parents and teachers will appreciate this “unplugged” way of understanding how to create and troubleshoot video games. A basic Bloxels set contains one gameboard, 250 colored blocks, and a guidebook ($50). Gameboards for school use are more economical when purchased in quantity. The largest set includes 20 gameboards, 3,200 blocks, and a video chat session with the team ($500). Bloxels is Apple, Android, and Kindle compatible. 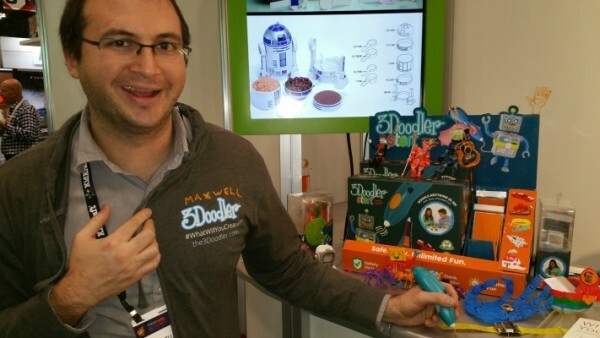 The pride Maxwell Bogue has for his wares is evident at the 3Doodler booth. Since 3Doodler first launched its Kickstarter campaign in 2013, it has been a fan favorite for maker spaces across the country. What’s the noise about 3Doodler now? It’s the new kid safe, ecofriendly 3Doodler Start. Maxwell Bogue told me during our conversation that the filament for this version of 3Doodler has been in development for three years. It can also be peeled off and can transfer printer photos, much like Silly Putty. Having no hot components and using nontoxic, BPA-free, and completely biodegradable ecoplastic made from food-safe materials, the 3Doodler is safe for kids eight and older. Rechargeable, wireless, and easy to use, the 3Doodler Start is a great addition to maker spaces with young children. The cost of a pen also doesn’t break the bank ($39.99 preorder, $49.99 regular price). The bundle includes eight packs of filament, as opposed to two, and eight doodleblock templates to help even the least artistic create beautiful patterns and shapes ($79.99 preorder, $99.99 regular price). An educator price is a bargain at $500 for 12 pens. When asked why this new version was half the price of the adult version, Bogue smiled and said, “Well, because it’s for kids.” That should make every educator smile! I had always wanted to learn about Raspberry Pi and Arduinos, but I needed a hand-holding introduction. Kano is a computer-building kit that includes a Raspberry Pi 2 Model B and case, micro-SD card, keyboard, Wi-Fi dongle, and a speaker ($149.99) that can be hooked up to a TV, computer monitor, or the DIY screen kit ($129.99). The entire kit costs $249.99. With Kano, children as young as six can make music and art with code; code worlds in Minecraft; build radios, servers, and websites; do homework; and make documents. Kids use Python programming language to make Minecraft and Pong and Linux by going on a Terminal Quest and by making the video game Snake. (Your students can learn how to code Pong online.) Many kids love making their own LEGO stop-motion creations. StikBots are multijointed, rainbow-colored, flexible figures that are easy for kids of all ages to use. Sunction cups replace hands and feet, making it simple to pose StikBots in a variety of situations. With StikBots, the free Apple or Android app, and a phone or tablet, kids can turn any place into a portable movie studio. The possibilities are endless, from creating book trailers to public service announcements to short “explainer” videos. The app allows the camera to take single photos and string them together as one video. Because StikBots animate best at lower frame rates, the app is set to shoot at 10 frames per second, making it easy to know how long your video will be (60 frames equals six seconds). The ghost image feature allows you to see your last shot, so you can line up the next one. Other cool features include green screen special effects, remote shutter, and sound effects you can upload from the library or record yourself. For inspiration, check out the StikBot videos on Twitter (#StikBot). A kit of two StikBots and a tripod is $10, a pack of six is only $20, and the StikBot Studio is $20. StikBots is the fun, easy, economical way to bring stop motion creation to your makerspace. Dash and Dot strut their stuff. If you are going to purchase one robot package for your maker space, my choice is Dash and his little sister Dot from Wonder Workshop. Originally named Bo and Yana, Dash and Dot are a great way to introduce young children to robotics while also being adaptable for older kid use. Using free iOs and Android apps, students can apply what they have learned during the hour of code to a physical robot. Dash comes with a charging cord and two building brick connectors ($149.99) and Dot is only $49.99. The Wonder Pack including Dot, Dash, and accessories (bulldozer, xylophone, and smartphone mount). It costs $279.99 and is the best way to fully explore the world of Wonder Workshop. (I’m really excited about the launcher that transforms Dash into a projectile-launching machine.) With three projectiles and six stacking targets, students can learn how simple machines work. Although your younger kids might find Dot cute but “boring” because she doesn’t move, she is essential to teaching them about variables. The apps for Dash and Dot are rich and dynamic, making programming kid-friendly and fun. Dash and Dot can react to each other through Blockly, a drag and drop visual programming language. 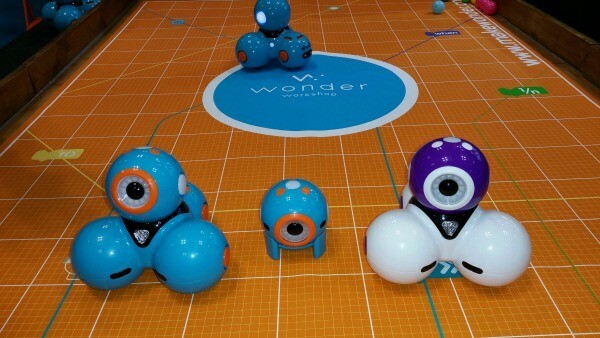 Students can program Dash and Dot with the Wonder app, and then the robots will follow the commands without the use of tablets or phones. At Toy Fair, I saw a new color combination (purple and white) that I hope Wonder Workshop will release soon. Trying to be environmentally conscious, I purchased a number of Boogie Boards for students to use in my library. To set the record straight, Boogie Boards are not a new kind of surfboard. They are electronic whiteboards that can be used over and over, “erased” digitally by the touch of a button. Boogie Boards are perfect for maker spaces because the students can use them to brainstorm and collaborate and then erase them digitally. I prefer them to traditional personal whiteboards because you don’t need dry erase markers, which can be expensive and spread fumes. Using Boogie Boards for note-taking helps to cut down on paper use and litter. Prices range from about $20 for the small Jot to about $100 for the Sync version. The Sync version allows you to write, save, connect, and access from your iPad, phone, or desktop. I was able to get my hands on the new Play n’ Trace Boogie Board, and I didn’t want to let it go! Shaped like an artist’s palette, this large version allows kids to trace anything under its blue translucent screen. No need for special batteries, as this educational toy runs on AAA batteries. The new lineup also includes a clear Jot version for flashcards with a learning app and a rainbow-colored Boogie Board that will remind you of those black scratchboards from art class. Although not available until July, the Think & Learn Code-A-Pillar by Fisher Price will be well worth the wait and the price ($49.99). This cute caterpillar’s moves and sounds are determined by the order in which the eight command segments are snapped together through USB connectors. This toy for kids ages three through eight operates on AA batteries and can handle 15 commands. Expansion packs ($15) with coding challenges and an app will be available for kids on the older end of the range. Oh, to be a kid again! Our reviewer's enthusiasm for MaKey MaKey is clearly contagious. Last, but not least, is THE inventor’s kit for school, library, and public maker spaces. Drum roll, please…Makey Makey! For only $50, JoyLabz packs a lot of creativity into a tiny kit: USB cable, seven alligator clips, six connector wires, and 20 stickers. Inventors young and old can create banana pianos, operation games, musical paintings, interactive dance floors, and other wonders of their imaginations. Using common household items, one or more Makey Makey kits and a computer, kids can combine electronics and recyclables. Using Scratch, students can even program with Makey Makey. 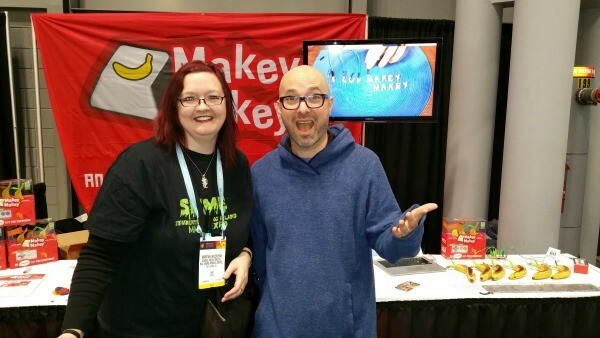 The new, portable Makey Makey GO reached its crowdfunding goal in only 69 minutes. So, what is all the hype about? This new toy is the size of a keychain, and you can even wear it is a necklace. It makes inventing even more portable, if you can believe it. Just plug Makey Makey GO into the USB port of your computer and then alligator clip an object to the board. It works with all programs and web pages, because all programs and web pages take keyboard and mouse input. With Makey Makey, your maker space can be any place! Kristina Holzweiss is the school library media specialist at Bay Shore (NY) Middle School and 2015 School Librarian of the Year. She also received the Lee Bryant Outstanding Teacher Award by New York State Association for Computers and Technologies in Education and the Fred Podolski Leadership and Innovation in Technology Award by the Long Island Technology Summit. She is the founder and director of SLIME (Students of Long Island Maker Expo). Check out her website here. Follow her on Twitter at @lieberrian, Reach her at kholzweiss@bayshoreschools.org.